(OXNARD, CA 10/7/14) Today’s statement by the Oxnard Police Department is further proof that 2 years after 2012’s officer-committed killings, the department’s management continues to avoid taking responsibility for its negligence and the pattern of practice that ultimately claimed Alfonso Limon’s life. Instead of practicing accountability and releasing officers with blood on their hands from duty, the Oxnard Police Department has chosen to retain them. Officer Pedro Rodriguez, who played a role on the night Alfonso Limon was killed, was even given the title of Resource Officer at Pacifica High School. Meanwhile, allegations are being investigated of a clique of officers, including Commanders, who wear tattoos displaying pride in firing on residents. Officers who kill or treat our community unjustly don’t belong in our streets or in our schools – they belong in a jail cell. While Chief Jeri Williams has spoken of a “healing process through open and effective dialogue,” residents have instead witnessed public relations and promotional hype from the OPD. Rather than taking ownership of the crisis in police-community relations and addressing the community’s concerns through structural changes and transparency, the Chief has gone on record rejecting community oversight mechanisms like a civilian review board and has blamed members of the community for raising the issue at city council meetings. The Chief has opened an invitation to collaborate with the Oxnard Police Department, but those who demand justice have faced repression. This was the case last October, when 95 officers were mobilized in a Special Enforcement Unit operation targeting a march led by the Limon family and members of the community. The only result of this operation was that our fellow organizer, Francisco “Chavo” Romero, was singled out and given 5 jaywalking tickets totaling $1000. The charges are still being fought and a motion to dismiss will be filed this Thursday, October 9, at 8:30am at Department 13 of the Ventura County Courthouse. Reconciliation cannot take place without healing. Healing cannot take place without peace. Peace cannot happen without accountability. Oxnard hasn’t been the exception in the rising nationwide occurrence of police terror and brutality – in fact, for years the City of Oxnard has been an industry leader in the ugly practice of harassing and abusing our working-class residents and communities of color. 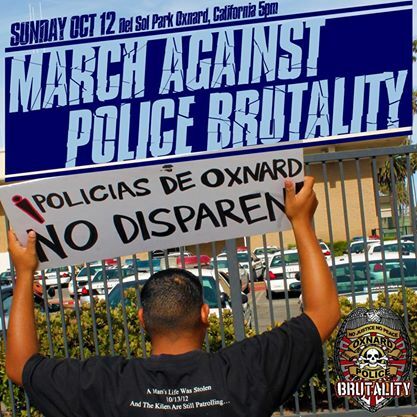 For these reasons, we invite residents to join us for a community march on Sunday, October 12, to mark the 2-year anniversary of Alfonso Limon Jr.’s death at the hands of the Oxnard Police Department. The Todo Poder al Pueblo Collective will be joined by the families of Jose Luis Ramirez (killed in 2011 by Port Hueneme officers), Robert Ramirez, Michael Mahoney, Alfonso Limon Jr., and other family members and friends of police brutality victims. The march will begin at 5 pm at Camino del Sol Park. - LEAVE OUR YOUTH IN PEACE - End the harassment and abuse! - Officers with blood on their hands like Pedro Rodriguez don't belong at Pacifica High! - ACCOUNTABILITY - We need Civilian Oversight and Community Control of the Oxnard Police Department! - Money for Services, not for Militarizing our Streets!